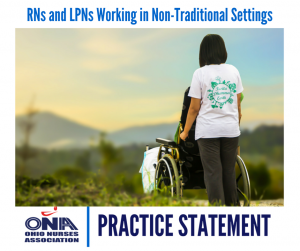 In accordance with the Code of Ethics for Nurses, the intent of this statement is to provide guidelines for RNs and LPNs working in non-traditional settings. The nurse’s role must be consistent with professional standards as developed by the nursing profession, the scope of practice as defined in the Law, and the rules promulgated by the Board of Nursing. All licensed nurses have a responsibility to ensure optimal patient safety and welfare. The Ohio Revised Code 4723.16 recognizes the ability of a Registered or Licensed Practical Nurse to deliver professional nursing services through various forms of business entities other than the more traditional venues. The nursing care delivered in non-traditional settings should reflect knowledge of current scientific principles and competent clinical skills. Additional training and certification may be required for the type of work being performed, i.e. law office consultant, IT professional.